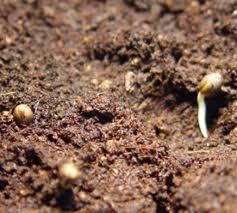 The most common and so far the most successful way of germinating ganja seeds is through soil germination. Marijuana plants can grow naturally in soil and by germinating seeds in this medium, roots are protected. However, there are some important points to remember when you opt to germinate the seeds in soil to prevent the risk of root rot. How to germinate weed seeds directly in soil? 1. Prepare the pots you will use to contain the soil. Then, fill the pots with soil that contains minerals suited for marijuana seedlings. 2. Moisten the soil in the pots. After which, create a small pocket of hole by pressing your fingers on the soil. 0.6 inches deep is quite good enough. 3. After creating a small circular depression, you can place the pot seed in each pot/container. Put the seed at the center with pointed tip down. 4. Cover the seed with soil so it is 1/8 to ¼ inch deep. Then, repeat the same process with all the other marijuana seeds. 5. Leave the pot seeds for 6 hours in dark period before turning the lights on. Adding nutrients in the soil during the germination process is not yet necessary. Just make sure that the soil is moistened regularly and never let it dry. Keep the soil in an ideal temperature which is about 72 degrees Fahrenheit. Do not let the soil become to cool. It is best to put the pots containing the seeds under a fluorescent lamp. Regularly check the soil and make sure it never runs dry. Use a sprayer to dampen the soil. Do not overwater to avoid root rot. Around 4 to 7 days, you can already expect growth of roots and tiny stems coming outfrom the seeds. Some seedlings will erupt from the soil within 48 hours. Seedlings are fragile so do not transplant them immediately. Transplanting can be done once the young cannabis plants are about 5 to 10 cm in height.